Star Wars and Family Guy...not the kind of couple you’d normally think of, but then again, you wouldn’t have thought Han and Leia would be getting together. And that worked out pretty darn good, as does the Family Guy Star Wars special. “Spaceballs” this ain’t, but for a 45 minute animated special, this is as good as it gets. “Blue Harvest” (the title is taken from the codename for “Return of the Jedi” when the film was in production) tells the story of the original Star Wars film with Family Guy characters. Chris is Luke, Peter is Han, Brian is Chewbacca, Lois is Leia, and Stewie is Darth Vader (who else?) One of the funniest elements of the special is the casting of characters. Peter as Han Solo is simply inspired, and I’ll always get a kick out of Brian with Chewbacca animation. Cleveland and Quagmire are cast as C-3P0 and R2-D2, with uproarious results, and there are plenty of great cameos by other Family Guy characters. Basically, the special goes scene by scene through the first Star Wars film, using the same music, sound effects, shot compositions, and even dialogue, with a humorous spin on things every few seconds. At first, this was a bit unsettling; this is not straight parody. More like humorous homage. But it really works once you get into the groove. They poke fun at all the little plot holes in the film, and throw in humorous animations and additions to the plot and dialogue, kind of like the jokes you’d crack watching the real film with a friend. There are some great jokes, such as Peter (Han) getting angry at Chris (Luke) for judging him because he doesn’t believe in the force. (“You’re judging me about something you learned three hours ago?”—classic...) Combined with the shear hilarity of seeing our favorite Family Guy characters portray the Star Wars cast, as well as the many visual and text jokes, you’ve got a winner of an episode. Not only is the comedy top notch, but the animation, sound quality, everything is of well above average quality for a Family Guy episode. This was obviously a labor of love for the creators, and it comes through very clearly watching the episode. Simply put, this is one of Family Guy’s finest episodes ever, and is a treat for fans of both Star Wars and Family Guy. The episode’s DVD presentation is nearly flawless. For starters, this is the original uncut version of the episode, and includes about 5 minutes of footage cut for broadcast, as well as some more risqué changes to the audio. The new footage, interestingly, focuses mainly on appearances by Family Guy characters absent in the televised version. These new scenes are all funny and a real treat to see. Moving on to the technical aspects, we have to start with the one flaw on the disc, the video. In no way is the video quality bad, but because the episode is only 48 minutes long, and they could have devoted a whole layer, or close to a whole layer to it, I would expect it to be better. Colors are, for the most part, vibrant and well defined, but sometimes they seem to bright or washed out. Contrast also is off; many of the blacks look grey, and it can be distracting sometimes. There’s lots of edge enhancement used, mostly in the fifteen minutes, and it’s also distracting. Keep in mind, it is a 4x3 image, and I’m watching it on a 16x9 hi-def display, which makes these problems more evident. I went ahead and sampled the video on a regular 4x3 TV, and it looks very good here. No matter what kind of TV you watch it on though, the image is still overall solid, with good detail that does justice to the very well animated image. The audio, however, is an entirely different matter. This sound has an incredibly vibrant quality to it; the John Williams score blares out loud and proud, and the sound effects also have a wonderful clarity. Dialogue takes center stage most of the time, and comes through very clearly. Darth Stewie, C3PO (Quagmire) and R2-D2’s (Cleveland’s) voices were all run through digital filters to sound like they were coming from a machine, and the hollow, ringing quality demonstrates just how good an audio track this is. Animated shows shouldn’t have sound this good, but here it is. The sound easily makes up for flaws in the image. The extras really push this disc over the edge though; they’ve put together a great batch of extras that make this one episode disc still worth a purchase. First up is a commentary track with Seth MacFarlane and a handful of writers, directors, and producers. There’s at least ten people on this track, and everyone’s got good things to say. Stories about production are told, tidbits about the animation, and the crew’s huge affection for Star Wars is made extremely evident. Definitely worth a listen. Next is a conversation between Seth MacFarlane and George Lucas. This runs about 12 minutes, and is exactly what it sound like; Seth and George discussing the episode, Star Wars, and their careers. MacFarlane asks lots of silly, and sometimes serious questions. Surprisingly, Lucas is on board with all this, and matches MacFarlane’s humor with some of his own every time. There’s lots of good stuff here, the best of which being MacFarlane humming pieces of Star Wars music and asking Lucas where it appears in the trilogy. The second featurette on the disc is a 20-minute making of that includes animatics, storyboards and interviews from everyone involved. It doesn’t really delve into the making of the special all that much, but you do find out some cool information about the episode. Much of this information is explained in better detail on the commentary track, but this is still a good little feature. However, one of the most interesting bonuses is the Animatic version of the episode. An animatic, for those out of the loop, is a rough pencil version of the episode, much like a storyboard, with the audio track included. I usually dislike animatic versions of animated shows, but this is actually very special. Instead of just the regular audio track set to storyboards, the audio track on the animatic presents alternate dialogue, often with alternate versions of scenes, as well as some deleted sequences. This is most certainly a treat to see for fans of the episode, and definitely worth a watch. Finally, we have the Family Guy Star Wars clip show, which goes from episode one to the most recent episodes with (almost) every Star Wars joke ever made in the series. It runs ten minutes; they’ve made a lot of Star Wars jokes. This is fun, but I was a bit disappointed; it leaves out some of the most blatent Star Wars jokes from the series, including the scene from the Season 4 episode “Blind Ambition” where Peter gets a medal in an obvious parody of the ending to Episode 4. While this clip show is incomplete, it’s still a fun bonus for fans of the show. I’ve also got to mention some of the great little touches on the menus and packaging; the front of the packaging is an obvious, and brilliant, parody of the original Star Wars poster. Even the menus on this set are parody’s of the menus used on the 2004 Star Wars trilogy DVD release; a nice touch indeed. Huge Star Wars nerds like me will even notice that the type of DVD packaging used is the same type of packaging used for the 2006 Star Wars DVD releases. Whether this is blatant or not, it is interesting. The creators obviously put some work into making sure this disc is worth your cash; with a set of extras that will keep you entertained for a long time, as well as great audio and good video, you won’t feel guilty paying 15 dollars for one episode. But the batch of extras on disc one wasn’t enough; the creators really wanted to give viewers their money’s worth, and a second disc is included on the set. Don’t get to excited; this disc doesn’t go in your DVD player, and doesn’t have any special features per say. This disc includes a digital copy of the film, like the digital copy of Live Free or Die Hard included with that movie’s DVD release last year. Basically, you put disc two in your computer’s DVD drive and are given the option to put a digital copy of the film on your PC, Mac, iPod or other handheld video device. Since I’m one of the ten people in America without an iPod, this feature is useless to me, but anyone with a handheld video device should be thrilled. I think this feature should be standard on DVD releases from now on, considering how many people have portable video devices, and Fox seems to be moving in that direction. It really makes buying a DVD worth your money. 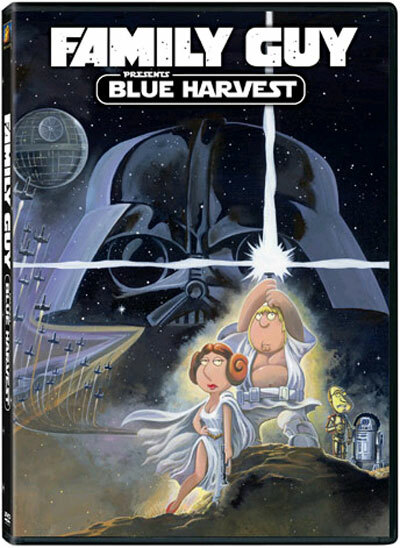 If you harbor love for Star Wars, Family Guy, or both, Blue Harvest is definitely worth a watch. The great batch of extras, as well as the digital copy, make this a really great DVD set that gets my recommendation.